We are always looking for amazing people to help us deliver the Soccer Fun to our little soccer stars throughout the Triangle and surrounding areas. With flexible schedules this is the perfect part-time job for you! Get involved during the weekend with our league program, deliver the soccer fun during the week with our weekly classes at our partner schools or do both! Check out the information and submit an application by following the link below! HappyFeet is growing and is now operating in many schools in the Triangle area. 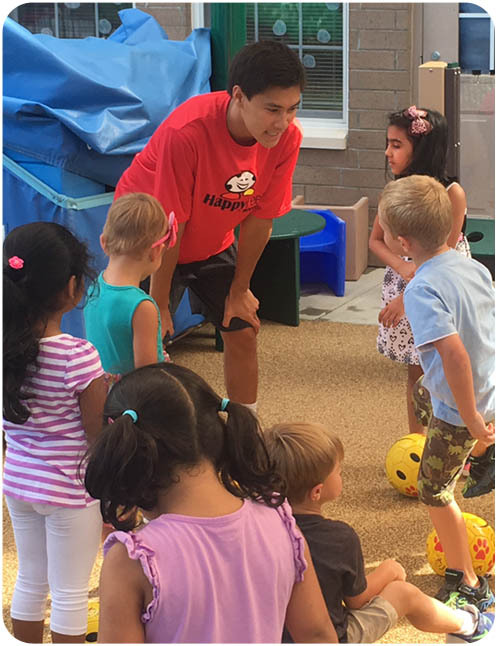 We need part-time coaches to take our exciting “story time with a soccer ball” program to preschools throughout the entire Triangle area. We are looking for energetic, kid-loving individuals who would have a BLAST leading 2-5 year olds in stories, songs, nursery rhymes, and fun games—all centered around a soccer ball! These daytime hours are very flexible, making this job perfect for stay at home moms or college students. HappyFeet is growing and is now operating in many schools in the Triangle area, and now have weekend league. We need part-time coaches to teach our exciting “story time with a soccer ball” league program to kids throughout the Triangle area. We are looking for energetic, kid-loving individuals who would have a BLAST leading 3-6 year olds in stories, songs, nursery rhymes, and fun games—all centered around a soccer ball!